Desperate: A child is transported in a fridge during floods after Cyclone Idai struck Buzi in Mozambique. Rescue workers plucked more survivors from trees and roofs to safety yesterday, a week after Cyclone Idai ripped through southern Africa and triggered devastating floods that have killed hundreds of people and displaced hundreds of thousands. The death toll in Mozambique has risen to 217 and around 15,000 people, many of them very ill, still need to be rescued, Land and Environment Minister Celso Correia said, though rescue workers continue to find bodies and the toll could rise sharply. “Our biggest fight is against the clock,” Mr Correia told a news conference, adding that 3,000 people had so far been rescued. In neighbouring Zimbabwe, the death toll jumped to 139. The UN World Food Programme (WFP), which is co-ordinating food drops, said 200,000 Zimbabweans would need urgent food aid for three months. In Malawi, 56 people were confirmed dead. 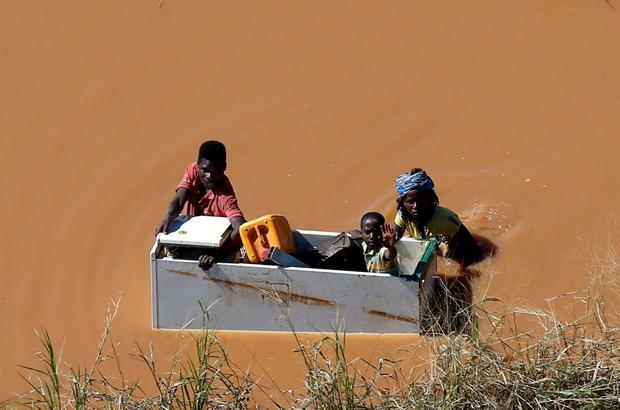 “This is a catastrophe… Cyclone Idai has destroyed so much in an instant and it will take years for people to recover what they have lost,” said Edgar Jone, country director in Mozambique for the Christian aid charity Tearfund. Helicopters whirred above the turbid, reddish-brown flood waters searching for people to ferry back to the port city of Beira, the main headquarters for the huge rescue operation. One helicopter returned with four children and two women, rescued from a small football stadium in an otherwise submerged village. One young child, with a broken leg, was alone, and hung limp from exhaustion as rescuers laid him on the grass before moving him into an ambulance. With more rains forecast, Christian worshippers sang hymns on an empty tract of land where a pulpit was all that remained of their pentecostal church. With some flood waters starting to recede, Mr Correia said the priority now was to deliver food and other supplies to people rather than take people out of the affected areas, although that was also still happening. TV station STV put the number of people still trapped in risky areas of Mozambique at 350,000 and said as many as 60,000 were believed stuck on roofs, trees and other higher places. The numbers could not be independently confirmed. Cyclone Idai lashed Beira with winds of up to 170kmh a week ago, then moved inland to Zimbabwe and Malawi, flattening buildings and putting the lives of millions at risk. A key priority is pushing into remaining areas affected by the flooding that have not yet been explored, said Connor Hartnady, leader of a South African rescue task force. Rescuers also want to move people from a basketball stadium near the Buzi river – one of the worst affected areas – to a village on higher ground, where aid organisations are setting up a temporary camp with a capacity of up to 600, he said. The US military stands ready to help the cyclone rescue effort, a representative of the US Agency for International Development (USAID) said, according to the minutes of a humanitarian meeting held on Wednesday. The charity Tearfund said the timing of the floods was disastrous, with harvesting due to start in coming weeks. Even before the floods, 5.3 million people had been experiencing food shortages, said its Zimbabwe director, Earnest Maswera. Mozambican president Filipe Nyusi, who has declared three days of national mourning, has said the eventual death toll from the cyclone and ensuing floods could rise to more than 1,000. Mozambique’s tiny $13bn (€11.4bn) economy is still recovering from a currency collapse and debt default. The cyclone knocked out Mozambican electricity exports to South Africa, exacerbating power cuts that are straining businesses in Africa’s most industrialised economy.